1673 Entire from Wharton Hall addressed "Ffor the Right Worspfull Sr Phillipp Musgrave, Eden Hall, These prEsent, in CumbErland" - a very fine privately-carried entire. Ex T Davis. 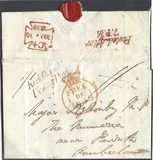 1838 Cover from Cockermouth to Harrington showing a VERY FINE BOXED WORKINGTON/PENNY POST. 1876 8d Orange, SG 156, R-K. Superb used with a PENRITH circular datestamp. 1838 Entire addressed to London showing a very fine straight line HAWKSHEAD with mileage erased, WE 498, in black and a very fine boxed KENDAL/P.Y POST in blue, WE 208. 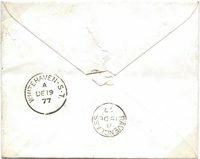 1841 2d LIGHT BLUE EMBOSSED STATIONERY ENVELOPE addressed to Lancaster and cancelled by a fine CARLISLE MALTESE CROSS. VERY SCARCE. 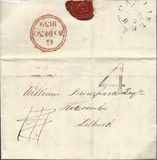 1838 Entire to Penrith showing a very fine convex WIGTON, CU 528. 1831 Local entire to Kendal showing a fine Type 1 KENDAL/PENNY POST in blue. 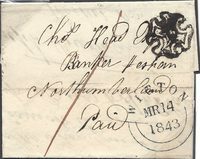 1853 Entire from Liverpool to Hawarth showing a very fine script-type "Mifsent to Carlisle" in blue. Not listed in the County catalogue. Very Rare.